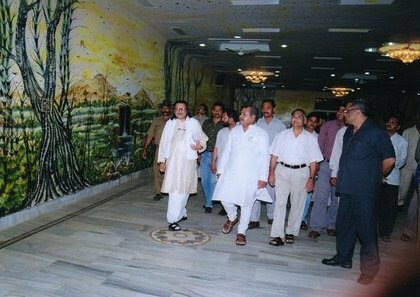 The largest indoor mural measures 904 m² (9,731 ft²) and was painted by six artists from 27th February to 5th March 2005 at Shyam Vatika, Saraswati Estate, Cimmco Tiraha, Gwalior, India. The painting was co-ordinated by a professional mural artist(Aasutosh Panigrahi) and the owner of the place R P Maheshwary , Ankur Maheshwary and Ankita Maheshwary. The art features on all interior walls and ceilings of a privately owned Auditorium, Shyam Vatika, which is used for Banquet purposes. The art as said was intentely done to break a previousy held record. 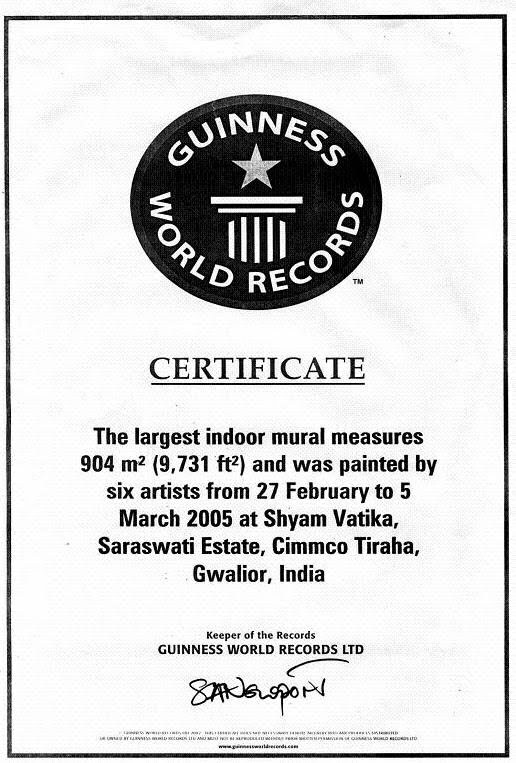 The six artist led by Aasutosh Panigrahi broke a previously held Australian record of 713 m². The previous largest indoor mural measured 727.52 m² (7,830.96 ft²) and was made at Youth Club, Bernie, Tasmania, Australia on 30 June 2004.